Well, at first I would like to pass this month's Aspiring Bakers theme - traditional Kueh. After seeing all my baker's friends so hardworking to submit their wonderful entries, it makes me bake too. 1) Mix & beat eggs with sugar. 2) Add on coconut milk, pandan extract and plain flour. Mix well. 3) Heat up the boiler and prepare all the molds. 4) Mix coconut rind with salt & tapioca flour together. 5) Put no.4 into the mold, press it until tight. 6) Pour the batter into no.5. 7) Steam it for 15 minutes. Remove from the heat and cold it. 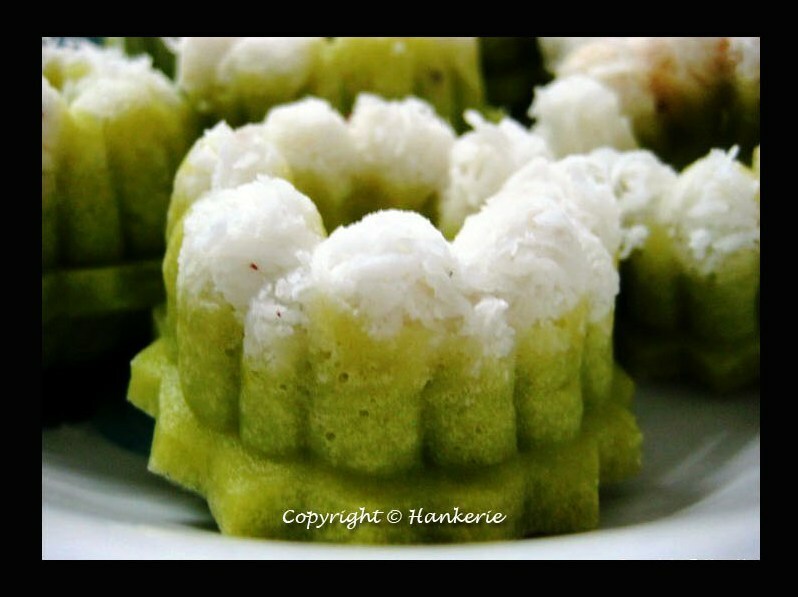 I am submitting for Aspiring Bakers #12: Traditional Kueh (October 2011), hosted by Small Small Baker.